I was really looking forward to Cruel Beauty, it sounded amazing and it was one of my most anticipated titles of the year. I dived into this as soon as I got my e-galley but I soon realised that this book was not at all what I was expecting which was a good thing in some parts and not a good thing in others. There were some amazing things about this book but there were also some bits that disappointed me and in the end Cruel Beauty was not as brilliant as I hoped it would be. I will start with the amazing bits. The writing in this book was glorious I found it lyrical and spell bounding. It was really nice to come across such beautiful writing in a YA books. It was not just the writing but the world building and descriptions that impressed. The inside of the Ignifex’s spooky and wonderful house really came alive for me it was so well created and written and I just got lost in all the beautiful details. I found the idea really interesting there was lots of mythology and I found it really intriguing. I would have liked it to have been a little more like Beauty and the Beast but I still liked the journey this book took me on. It was brave and daring and I really liked the plot and construction it was original and at times clever. But there were problems with this book mainly steaming from the main character Nyx. Cruel Beauty is a book where ever character is flawed and I quite like that because it mirrors life but at times Nyx was also annoying. She was like a broken record and always thought the same things. She mentioned her (also annoying) sister all the time, I felt like I didn’t go a page without her being mentioned. The character herself is barely in it but she consumes a lot of space. Nyx lacked personality, she was hell bent on revenge and bubbling over with hate but there was nothing to her at all. The romance and Nyx in the romance was also an issue. There is a love triangle in this book between Nyx, Ignifex and prisoner Shade. It is not a love triangle that you would expect and in some ways it could not be classed as a love triangle at all but it was still there and Nyx was still ridiculous when it came to the two men. Her attraction to Ignifex was a slow builder and I didn’t mind it but she was kissing Shade and talking about ‘love’ on her first night in the house. It was annoying. I cannot say much more about the romance without giving major plot twists away so I will leave it there. Ignifex was a stronger character he was a lot more interesting and came across better than Nyx. I liked him more and understood him but there could have been more to him. A majority of this book features only Ignifex and Nyx and it really needed them to be more interesting. It was a shame that the impact of the beautiful and creative writing and plot was tarnished by dull and annoying characters. 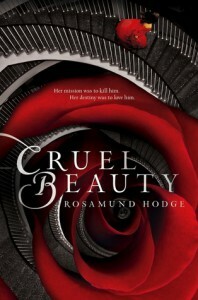 Cruel Beauty is an atmospheric and at times beautiful book with gorgeous writing but irritating characters and romance. I think it is a book that many YA fans will love and I think it will do very well but I wanted a little more from it. I would happily read more from this author as her writing was the stand out aspect of this book.